Nilfisk announces the launch of two new lines of NRTL-certified continuous-duty industrial vacuums for Class II, Division 2 and non-classified environments. All vacuums feature ETL-certification and are designed to meet NFPA 652 housekeeping recommendations for the safe collection of combustible dust, as laid out in Section 8.4.2.2. Machine design requirements to ensure NFPA 652 compliance include, but are not limited to, a stainless steel collection container, antistatic main filter, antistatic wheels and a variety of measures to ensure bonding and grounding throughout the unit. Both lines also feature easy-to-clean design and application-specific features for the food, pharmaceutical, and OEM industries. The GMP-compliant Nilfisk White Line (VHW) features stationary and portable units meeting the requirements for use in areas where hygiene is essential. Conical cartridge filters provide more surface area, extend filter life and resist clogging of fine dust. Nilfisk PullClean filter cleaning system reduces production downtime, enabling the user to clean the filter during operation. The Nilfisk CTS26, T48 and T63 machines offer a three-phase, vacuum solution with a variety of air power and suction needs within heavy industrial applications, ideal for the collection of heavy particulates. These machines come standard with a manual filter shaker, manometer and rear swiveling wheels with locking casters. 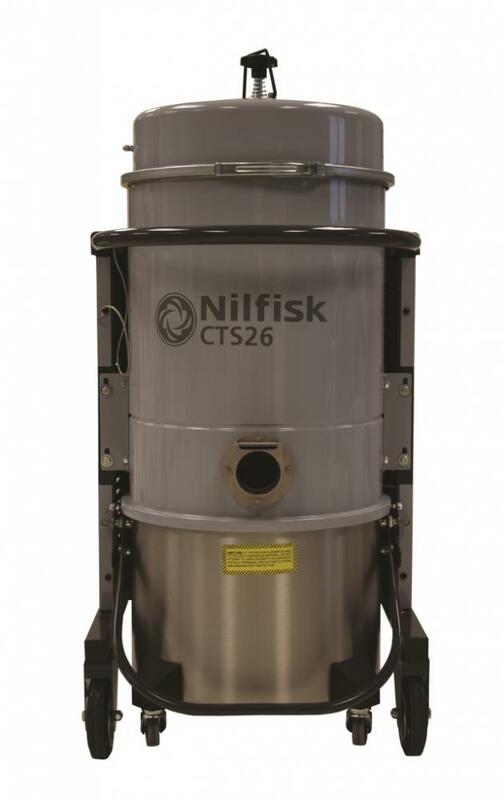 The launch of these new variants enhances Nilfisk’s current offering for combustible dust housekeeping, which already includes CSA-certified models that meet requirements for Class I environments. The company also offers a pneumatic line of hazardous location vacuums.